Singapore-headquartered online restaurant reservation firm Chope has raised $8 million from a group of investors, including F&H Fund Management, NSI Ventures, Frontier Ventures and Singapore Press Holdings and DSG Consumers Partners. Chope Group that has operations across Southeast Asia is also planning to enter the Indian market. EazyDiner Pvt Ltd, which is another DSG Consumer Partners portfolio company, operates in the same space. The two companies are exploring collaboration in the event of Chope's India entry and do not see each other as competitors. However, clarity on the nature of their proposed collaboration as to whether it may involve being not present in same cities or targeting different consumer segments is yet to emerge. Meanwhile, the fledgling table booking space in India may see intense competition as restaurant search firm Zomato too is entering the fray. Times Group-owned DineOut has already made some headway in the market. DineOut, which was bought by Times Group, a year ago, is present in Mumbai and Delhi. Chop is present in major Asian cities, including Singapore, Shanghai, Beijing, Hong Kong and Bangkok and has facilitated restaurant reservation for over 20 million diners. "Part of the fund that we recently raised will be earmarked for looking at our India expansion plans," Arrif Ziauddin, founder and CEO of Chope, told VCCircle. About the time frame for the Indian entry, he said, "It will be in months rather than years. Mumbai and Delhi are very attractive markets to begin with." The market is now ready for online restaurant booking because of huge mobile penetration, according to Ziauddin. "DSG, one of our investors, has strong presence in India which will be critical for our entry into the market. We are exploring collaboration with EazyDiner, another firm which they are backing," he said. "Chope is a market leader in Singapore and we are already a market leader in India. I think there is a great opportunity of synergy between both the brands and also we have already touched base and are in the process of knowledge sharing of best practises in each company," said Sue Reitz, managing director and co-founder of EazyDiner. EazyDiner, launched by senior journalist and food writer Vir Sanghvi, Reitz and a few others, raised its first round of funding from DSG Consumer Partners, Gurpreet Kohli and others in April. Reitz claimed that the company grew faster than its initial target, averaging 6,000 diners a month in Delhi and Gurgaon. EazyDiner will enter Mumbai on July 15. In just five months, the company reached an Alexa rank of 1,780, making it the third in the food tech space after Zomato and Foodpanda in India in terms of internet traffic, according to Reitz. She said, "We will have over 500 restaurants in Delhi and Mumbai by July 15, offering instant online reservations. We believe with our launch in Mumbai and three other cities this year we will be close to an Alexa rank of 500. We aim for half a million app downloads by the end of this year." "Both companies are exploring potential avenues for collaboration but we don't want to force," said Deepak Shahdadpuri, DSG Consumer Partners Asia, about possible future partnership between investee companies Chope and EazyDiner. "Online restaurant reservation is still at a nascent stage in India and we clearly see an opportunity in this segment," Shahdadpuri said. 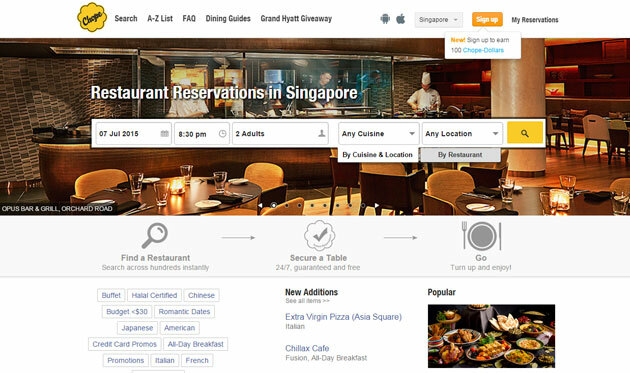 He said real-time table-booking is a fairly matured business globally and cited the $2.6 billion acquisition of OpenTable, a market leader in North America, by online travel company Priceline. An early-stage VC firm that invests in consumer and consumer-tech sector in India and Southeast Asia, DSG Consumer Partners has previously backed names like Sula Wines, Bakers Circle, Exito Gourmet, Salt Water Cafe, Saraf Foods and Smoke House Deli. The firm last month participated in a $6 million funding round in food ingredients company Veeba Foods, which it has been backing from an early stage.